I first drove the new all-electric MINI E at the LA Auto Show, but didn't have much time with it. That all changed when I spent time behind the wheel here in New York. You'll find there's two ways to slow down the MINI E. The first is the old fashioned way using the brake. The new hotness? Just pulling your foot off the gas. 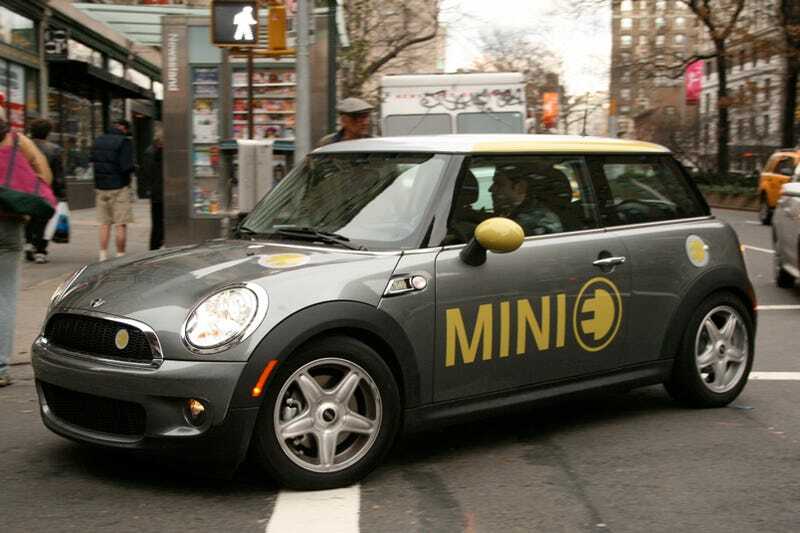 In the MINI E, that's when regenerative braking kicks in automatically, slowly slowing you to a halt. At first it's disconcerting not being able to coast. It's like the feeling you get in an amusement part ride — a complete lack of control. But after a short while that feeling goes away. Well, at least that part of the amusement park ride. Acceleration in the new 'lectric Cooper still feels like the amusement park ride we've come to expect from the little guy. The two seat all-electric car delivers 204 HP and 162 lb-ft of torque, but because it's an electric, all that torque's immediately available to you — as long as the wheels can keep up. BMW engineers have worked hard to create a TSC system that can handle the quickly upward sloping curve, but it's still torque-y as all get-out. As long as you can get a clean start, the engineers claim you'll be able to drop a 0-to-60 time of 8.5 seconds. Not too shabby for a vehicle with a top speed of only 95 MPH and a 156 mile capacity on the batteries. This ain't no Tesla Roadster, but it'll certainly give you more get up and go than you'd expect considering the heft of this 'lectric Cooper — 3,230 lbs. Weight isn't the only, umm, weight it's got hanging 'round it's neck. There's also the issue of the back seat and trunk area, both of which pretty much disappear for storage space for the 5,088 cells that make up the battery pack. There's also the issue of cost. If you want to be one of the 500 chosen people able to lease the plug-in MINI you'll need to fill out the tricky online application before Christmas Eve. Then, if you're selected, you've got to be willing to fork over $850 a month for the ability to be the smuggest coastal inhabitant on the block. Why coastal inhabitant? Well, it'll only be available in two markets, the first one being California and the second being NY/NJ. How does it recharge? Each MINI E comes with a custom charger that'll run 240 volts (Ed. — sorry guys, I should have re-read this at least once before I hit publish!</em) at 50 amps, which means you can charge the car fully in two to three hours. Not too shabby if you ask us. So, is the MINI E for you? It depends. The all-electric Cooper's the car for you if you've got a hankering for driving green, you've got the cash to drop and you're one of those people who likes to be the first on your street with the new toy. Because in this economy, isn't that pretty much everyone? Yeah, not so much. Still, the MINI E's the first electric car I could see my girlfriend driving, and it's not just because she loves the MINI Cooper S, it's because it's the right form factor for city driving and it's not trying to be a race car. We approve of the idea, even if the cost'll make me declare bankruptcy — if my application is accepted. What can I say, the girlfriend wants one.